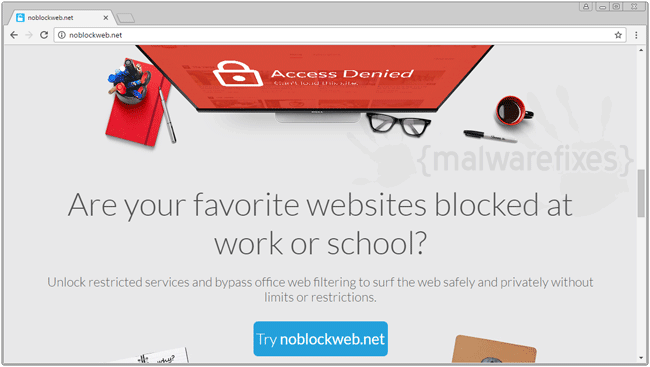 If you are trying to access restricted websites, you may bump into a program or services offered by Noblockweb.net. This dubious geo-restriction function may be activated onto your computer in two ways. First is trough deceptive scheme. Noblockweb.net claims to bypass any website restrictions by just configuring your internet browser settings to utilize their server. Another way to do this is via Adware or third party applications. Through this method, installation of freeware can cause unwanted changes on the browser. Like the first one, it will alter configuration of browser’s proxy. Either way, letting your internet traffic passes through Noblockweb.net servers can only cause several annoyances. This can lead to the display of excessive advertisements, redirects, and pop-up issues. In addition, Noblockweb.net can monitor web-browsing activities of those who are using their services. Gathered data are used to further enhance the display of advertisements, making it more relevant to user’s interests. Even though Noblockweb.net is useful in bypassing web restrictions, your computer or any gadgets may still bear the consequences for using this dubious program. It’s either use it at your own risks or find another one that offers similar functions without endangering your online privacy. If you need to remove Noblockweb.net adware and all its settings on the browser, please see the guide below. After deleting the entries, scanning the computer with suggested tools will help you find and eliminate any adware that are hidden on the computer. 3. Look for and remove Noblockweb.net entry. If not present, look for any suspicious labels that was installed recently. 4. It searches for presence of harmful programs, plug-ins, add-ons, or any data that were found malicious and linked to Noblockweb.net. You need to Clean all items detected by this tool. After the previous scans, you may have deleted Noblockweb.net from the affected browser. This next step will ensure that no more module of adware will be left on the browser. This free tool scans and checks the browser for unwanted add-on and extension, and if found, Avast Browser Cleanup will give you a report and suggestion. 4. Avast Browser Cleanup will confirm before it permanently deletes the add-on. Please click Yes to proceed with the removal of Noblockweb.net on the affected browser. Browsers like Google Chrome, Internet Explorer, and Safari are using system proxy settings. Therefore, you need to remove Noblockweb.net from Internet Properties of the operating system. Mozilla Firefox browser can be configured separately. 5. Delete Noblockweb.net/wpad.dat under “Use Automatic Configuration Script“. Refer to image below. 5. Go to Automatic proxy configuration URL section and Delete the string Noblockweb.net/wpad.dat from the field. Please refer to image below. 6. 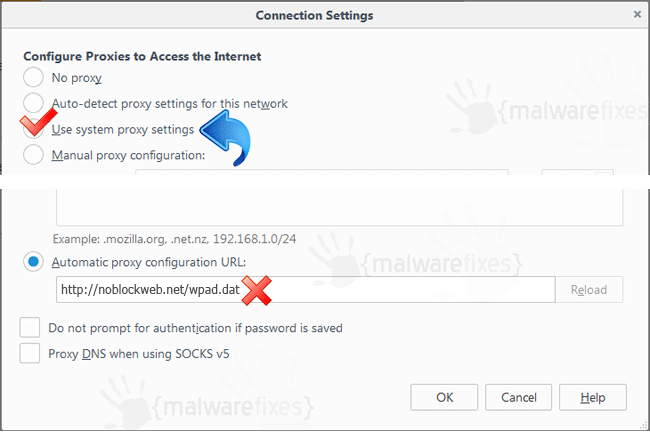 Lastly, Select “Use System Proxy Settings” to deactivate proxy configured by Noblockweb.net.